The 2019 Infiniti QX60 delivers impressive levels of quality, utility and value, but it also has some obvious shortcomings. The redesigned Infiniti QX50 is a smallish luxury SUV with promising technology and a lush, roomy interior, but it has a few warts. 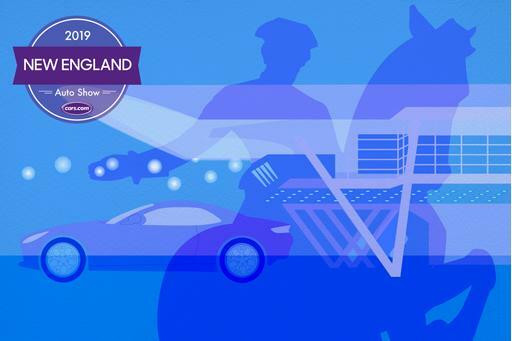 The QX50 placed third among seven compact luxury SUVs in Cars.com's Luxury Compact SUV Challenge — a credit to its strong overall utility — but its drivability is lackluster and it's missing some desirable features. After skipping the 2018 model year, the QX50 returns in redesigned form for 2019. 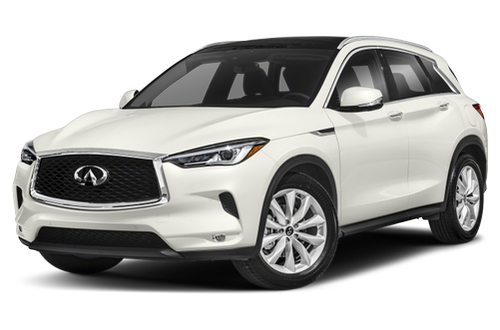 I attended Infiniti's Los Angeles-area media preview (per our ethics policy, Cars.com pays for its airfare and lodging at automaker-hosted events), then participated in our SUV Challenge as a judge, driving the QX50's top trim level in both cases. On sale now, the QX50 comes in Pure, Luxe and Essential trims. A stone's throw from the QX50 Concept and QX Sport Inspiration Concept that preceded it, the production QX50 follows the design language seen on the Q50 sedan and Q60 coupe — both handsome cars. Inside, Infiniti wraps much of the QX50's dashboard, upper doors and center console in a mix of stitched vinyl and real leather. I couldn't tell the difference; it's convincing stuff, with raised seams and rich textures where your arms and elbows rest. Cheaper plastics hang below eye level, which we've come to expect in this class, and Infiniti hides them well enough. Pure and Luxe trims have vinyl seats; Essential versions get leather. Pile up the options beyond that and you can get quilted semi-aniline leather seats with suedelike accents on the upper doors, dash and console. As such, the cabin is mighty handsome. It's roomy, too. Both rows have adult-friendly room, with reclining and sliding adjustments for the backseat. We've found many inconsistencies in manufacturer-reported cargo specs, but in Cars.com's measurements, the QX50 thumped six rivals during our luxury compact SUV comparison, with 7 to 23 percent more space behind the backseat. Less handsome are the dashboard's twin touchscreens, which emulate those in the Q50 and Q60. The displays (8 inches for the upper unit, 7 inches for the lower) have straightforward menus and pinch-and-swipe capability, but the skyward angle of the upper unit means it's often washed out by sunlight. The screens appear plucked from different cars, with separate resolution and response times, and the whole setup makes sense only if you leave a navigation map up top — something two of the QX50's three trim levels can't have. A navigation map from Apple CarPlay or Android Auto would work, too, but the QX50 offers neither of these smartphone integrations. Infiniti says wireless versions of both will come in future model years, as will wireless phone charging — but that will require new hardware, so don't expect an update for existing owners. In the here and now, the 2019 QX50 is a mobile-device Luddite. Out goes the old QX50's big V-6, replaced by a turbocharged four-cylinder engine (268 horsepower, 280 pounds-feet of torque) with a high-tech variable compression ratio that drives the front or all four wheels through a continuously variable automatic transmission. As such, the QX50 charges up steep inclines and makes quick work of freeway onramps. In Cars.com's track testing, it hit 60 mph in 6.54 seconds, third quickest in the test behind the turbocharged-four-cylinder Audi Q5 (6.15 seconds) and Alfa Romeo Stelvio (a standout 5.33 seconds). Alas, none of that power comes on quickly or smoothly. The culprit is hard to pinpoint — the CVT, electronic throttle tuning, variable compression or just some old-school turbo lag — but the result is clear: The QX50 takes too long to get going. The gas pedal delivers feeble power up front, then abrupt bursts of grunt when the cavalry arrives. 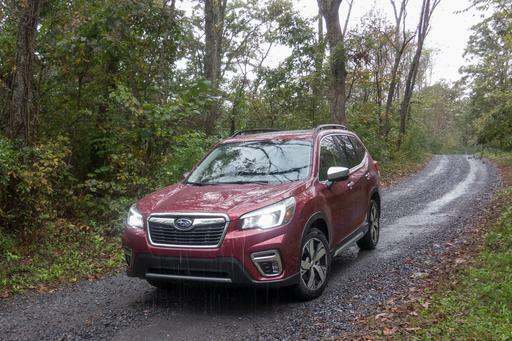 Step on it for an uphill start, and the power swell can spin the front wheels for moments on end before the AWD finally transfers power to the rear. Swell this is not. Drive the car harder, however, and things improve. The transmission responds more readily to your right foot, and it cuts engine revs to simulate upshifts during moderate acceleration — a contrast with most CVTs, which introduce faux upshifts only under full throttle near redline. Sport mode even kicks up revs on downhill grades to simulate downshifts, rev-matching and all. It's lively; I only wish the responsiveness came during less aggressive driving. 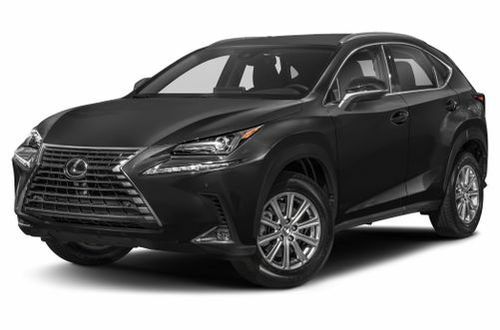 The chassis stays reasonably planted over rapid elevation changes, but ride quality with the QX50's standard 19-inch wheels is a touch busy on anything but glass-smooth pavement. It's seldom harsh or bouncy, but it lacks the sophistication that rivals like the BMW X3 nail. (Twenty-inch wheels and lower-profile tires are optional on the QX50, but I didn't drive any model thus equipped.) Suspension tuning is the same across all trim levels; adaptive shock absorbers, a common option among competitors, aren't offered. Gas mileage is much improved over the outgoing QX50 — 27 mpg combined with front-wheel drive and 26 mpg with AWD, figures that edge out the competition — but the QX50 stipulates premium gas in all but emergency situations. Some competitors allow the cheap stuff more readily; the Cadillac XT5 even recommends it. The QX50 offers Direct Adaptive Steering, the latest generation of Infiniti's steer-by-wire system that we've criticized in earlier iterations. It turns steering into a low-effort affair, which I suspect most SUV drivers will love. Don't fret the three-point turn: In a steer-by-wire QX50, you can do it with one finger. Enthusiasts may beg to differ, however. As equipped, feedback is numb on twisting mountain roads even in Sport mode, and it's utterly absent at low speeds. Without DAS, the QX50 requires more effort to steer at low speed, though it's still on the light side. Feedback improves on curvy roads, but the SUV's dynamics disappoint. It's a mushy, nose-heavy experience to throw the QX50 around, and that's an area where competitors with rear-drive platforms or smarter AWD hold a clear advantage. You can drive with just a few fingers if you get the QX50's optional ProPilot Assist system. Also offered in the Leaf and Rogue from Infiniti's parent company, Nissan, ProPilot Assist is packaged with the DAS option in the QX50. It includes adaptive cruise control and lane-centering steering, both of which work all the way to a stop. Intended for highways with proper lane markings, ProPilot Assist kept natural position for the most part on L.A.'s Highway 101, tracking mild curves and merging traffic like a human driver might. It isn't a hands-free system like Cadillac's Super Cruise, and it warns you in short order if it senses you've let go of the steering wheel. It also requires a forceful hand: My test car sometimes flashed warnings when I gave insufficient resistance even with my hands on the rim. 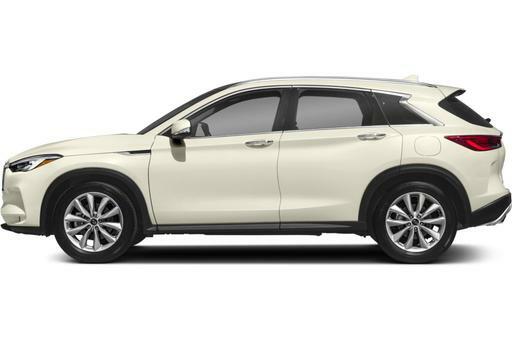 As of this writing, the 2019 QX50 had yet to be crash-tested. 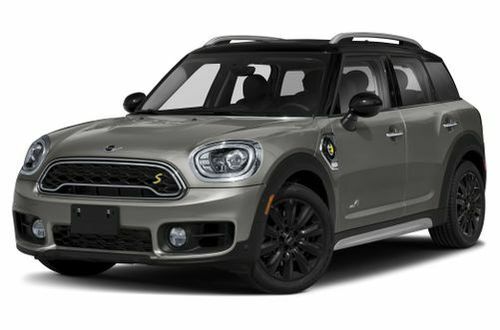 Forward collision warning with automatic emergency braking at speeds up to 50 mph is standard; a blind spot warning system and the ProPilot suite of driving technology are both optional. In Cars.com's Car Seat Check, floppy seat belt buckles made access tougher for children in booster seats, but we found easy-to-access Latch anchors and sufficient clearance for rear-facing seats. Front-drive models start around $37,500, with standard features like keyless access with push-button start, power front seats and dual-zone automatic climate control. Some options seem stingy (even on the top trim level, for example, heated seats still cost extra), but a loaded QX50 Essential AWD can approach $60,000. 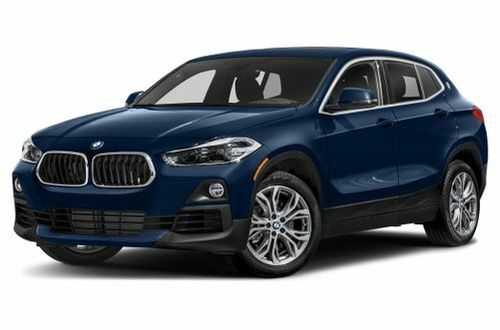 Still, that's a relative value for this class: Base-engine versions of the Audi Q5, BMW X3, Mercedes-Benz GLC-Class and Volvo XC60 start in the low $40,000s, and most exceed 60 grand — or balloon well past it, in the case of the X3 and GLC — with options. The QX50's podium finish in Cars.com's Luxury Compact SUV Challenge is a testament to its roominess and comfort, but its shortcomings remain significant. 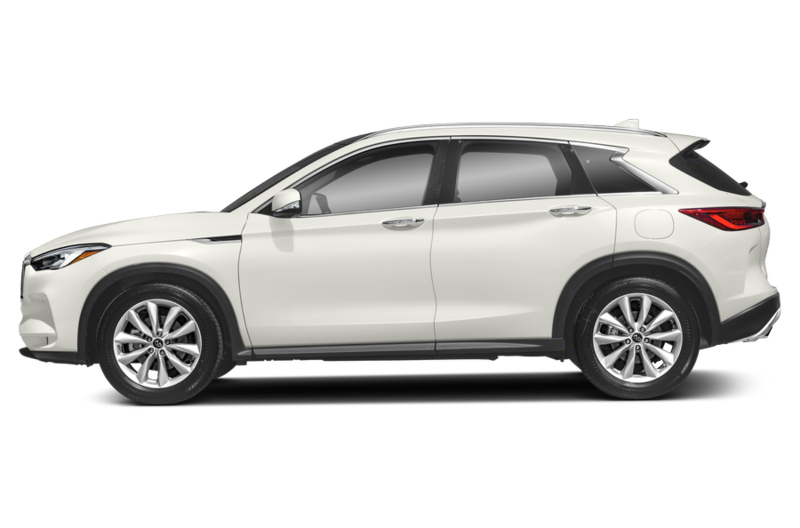 The 2019 INFINITI QX50 has not been tested. Like what you see? 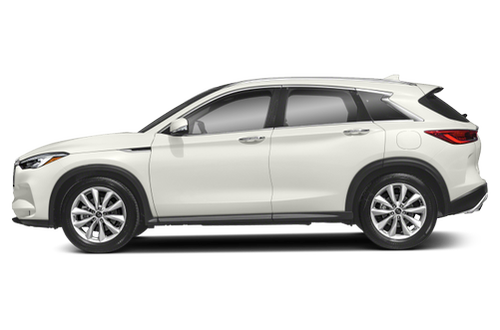 Find the best deal on a INFINITI QX50 today.